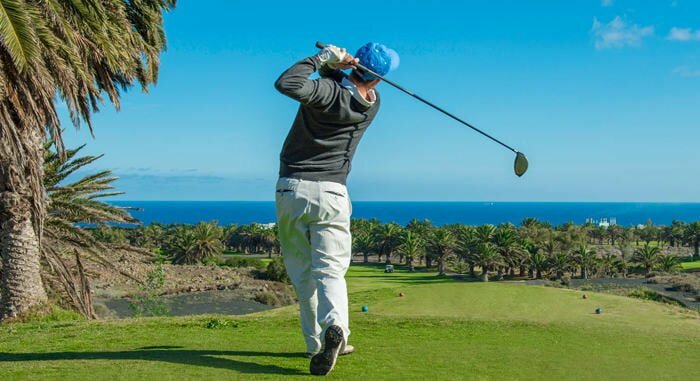 Previously described as the best golf course in the Canary Islands by ex-number 1 Severiano Ballesteros, the volcanic slopes and stunning views of the nearby Atlantic Ocean, are what makes this golf course so special. The course is also occupied by over 3000 palm trees, and these are definitely a beautiful addition to the 18 holes. Playing around the trees, whilst also having to dodge the many pits and bunkers definitely ads an element on fun for recreational players, although, that being said, these many obstacles also make the course far more challenging for pros who decide to try and tackle the 18 holes. Of course, when you play through the course, its not just palm trees, but also the incredible volcanic lava fields, which roll down the slopes of the nearby volcano that makes this course so unique and captivating, and this course definitely represents Landzarote at its finest. After a round of golf, why not visit the restaurant on site Tres Lunas, where you can enjoy the many traditional cuisines of Lanzarote from tapas, shrimp, or lobster. Why not go and sit on the terracotta patio and look out at the golf course, the Atlantic ocean and the surrounding stunning landscapes.